There are many interesting places to visit in the province of Granada and in the nearby towns in the rest of Andalusia. Below you can find information about the most popular places to visit nearby Granada. 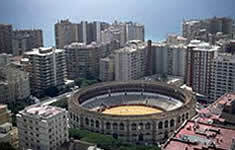 If you are looking for arranged group excursions please see the section Tourist Activities in Spain. Only 1 hour away from Granada is located the famous winter-sport resort Sierra Nevada. In Sierra Nevada it is possible to practice ski sport from December to April and rock climbing, trekking and mountain biking the rest of the year. West to Granada, about 45 km away, you find the little white village Loja. Apart from its classical Andalusian style villas you can find the Alcazaba fortress, a Moorish fortress from the 9th century and the church of San Gabriel from the 16th century designed by Diego de Siloe. To the Northeast of Granada about 100 km away are located the villages Baza. In Baza there are excellent examples of Moorish architecture like the fortress Alcazaba. For people interested in archeology the sculpture known as 'la Dama de Baza' (the Lady of Baza), which is from the 4th century b.c. was found there. Alhama is another interesting villages to visit. It is located about 50 km from Granada and is known for its hot baths (Alhama in Arab means hot bath wherefrom the town name has its origin). Apart from the hot baths it is worth visiting the Arab fortress in the town and the waterfalls Los Infiernos just outside the town. If you are interested in taking a weekend trip a bit further away Malaga or Sevilla are good options. Apart from the beach you can also discover some of the biggest and most popular pubs and discos in Spain in the tourist areas of Costa del Sol. The capital of Andalusia, Sevilla can provide visitors with both cultural and non-cultural attractions and is specially popular during the wholy week and the April festival (Feria de Abril). In the province of Cadiz people interested in wind surfing can find one of the best places in the world - Tarifa. From Cadiz it is also possible to visit the rock of Gibraltar, the British tax free colony in the Iberian Peninsula. For people interesting in seeing the capital Cadiz it can be recommend to go there during the carnival (February), as they celebrate it with great style. While visiting Cadiz it can be recommended to also visit the town Jerez, which is famous for its Sherry production and for its 'dancing horse shows'.